The South Lakeland Orchard Group was formed in 2007 by people who are passionate about orchard fruits in the South Lakeland district of Cumbria, England. Our purpose is to support the conservation, maintenance and renovation of existing fruit orchards and encourage the planting of new orchards in the South Lakeland area, recognising the importance of bio-diversity and the preservation of old local varieties of fruit. Many members join when they want to re-invigorate their orchards using the traditional techniques used for hundreds of years. Others are planning new orchards and we offer a wide range of popular workshops where members can come and learn grafting, budding, pruning and other valuable orchard skills. 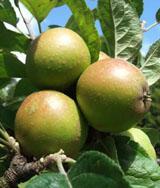 Our members have a wide knowledge about orchard maintenance, and unparalleled experience of local heritage varieties. We also sell a wide variety of trees which are suitable for our northern climate and maintain an orchard where some 180 trees are being grown. SLOG also owns two complete sets of apple pressing equipment that is available for members to hire and we wish to encourage as much use as possible during the short apple pressing season of mid September to mid November. We welcome new members joining through this site. Once you have signed up here, payment can be by standing order, cheque or BACS and you will receive full instructions with the welcome pack, once you have completed the joining process here. phone - 01539 824776. This is a work number so not in use during evenings or weekends.